Intertops Poker has added eight special Hold’em and Omaha poker tournaments to keep poker players busy over the long Easter weekend. And for those Easter bunnies that need to top up their account there’s a 50% (up to $300) Reload Bonus available all weekend. The special Easter weekend poker tournaments are in addition to the $15,000 and $25,000 Guaranteed Tournaments Intertops Poker presents every Sunday. The complete poker tournament schedule is listed at http://poker.intertops.eu/en/tournaments/. Players can register for any of them by going to the Tournaments tab in their poker client. 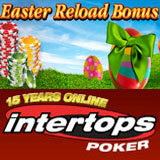 To claim the Easter Reload Bonus players are required to enter the coupon code “EASTER12” as they make their deposit. Further information on this bonus and other poker bonuses is available at www.poker.intertops.eu/en/promotions. One of the world’s most established and trusted online poker rooms, Intertops Poker is one of the most popular poker sites on the Cake Poker Network where there are always lots of players at every level online.